The Carretera Austral is not your average road. Weaving past the natural obstacles of Patagonia’s rugged landscape, it forges a path through some of the most beautiful and remote parts of southern Chile. As our truck carefully navigated the winding way, I attempted to peer through the shifting veil of mist which obscured much of the wild scenery. A wide, shallow river meandered beneath us as we drove across a juddering bridge. 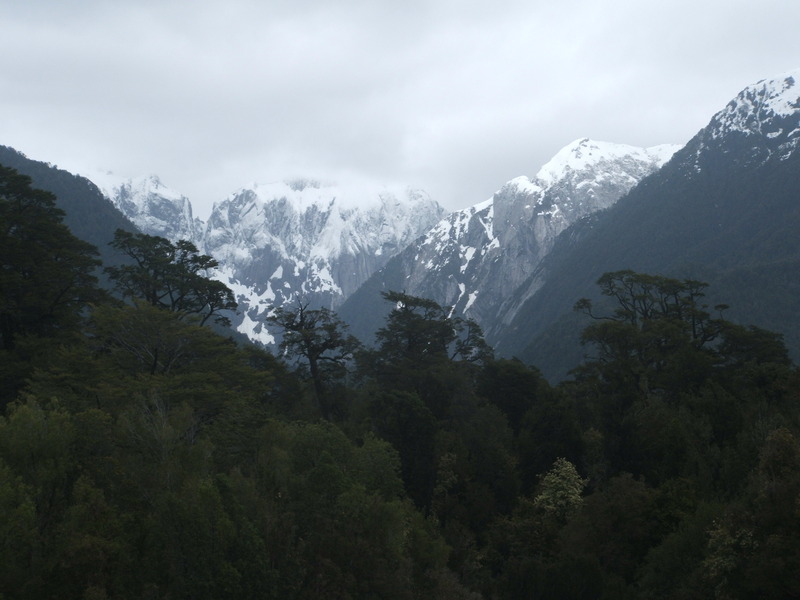 Thick tangles of trees sprawled in the mountains’ shadows, while snow dusted peaks merged into a sky saturated with cloud. Although technically a road, some sections of the Carretera Austral were little more than gravel walkways. What would ordinarily be classed as a country lane in Britain was the official route through these otherwise inaccessible lands. The uneven ground made for a bumpy ride, and at times, it felt like driving over corrugated iron. However, the sheer lack of traffic made up for the poor road condition – notwithstanding the resident cows, of course. Yet the local fauna were just one of the many interesting features of this unique road. Along the way, we stopped to visit the Ventisquero Colgante – a glacier which sits between two mountainous slopes and leans into the valley below. Like hands cupping water, the rocks held the melting ice as it spilled gradually over the brim. 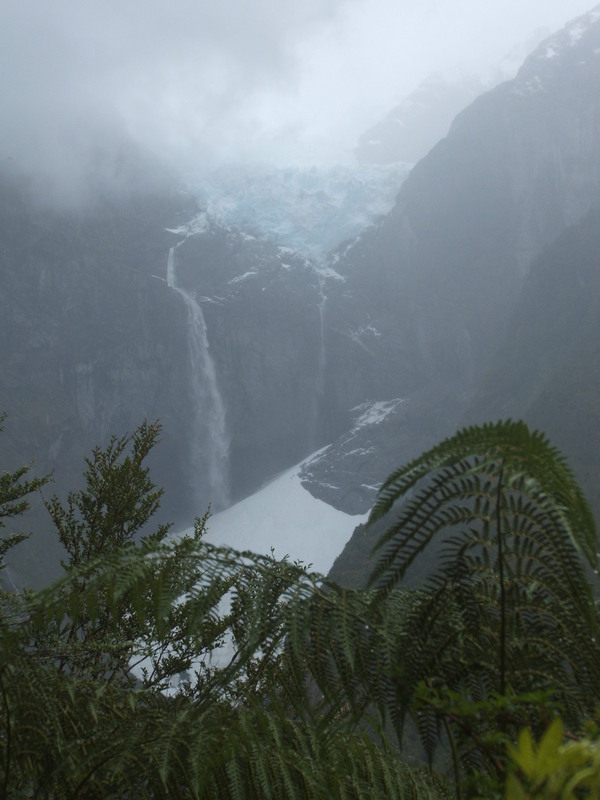 Thanks to a typo on our itinerary, I’d been convinced for years that it was called the Colgate glacier. Even now, I can’t look at my photo without thinking of a tube of toothpaste. To reach the viewpoint, we hiked up a steep, overgrown trail. On the way back down, I took a slower pace and let my camera lens linger over the surroundings. Moss covered trees pushed through the dense vegetation, with wafting ferns and hanging vines creating a jungle-like scene. At the end of the walk, we crossed over a rock-strewn river – yet another natural wonder in Patagonia’s infinitely impressive playground. 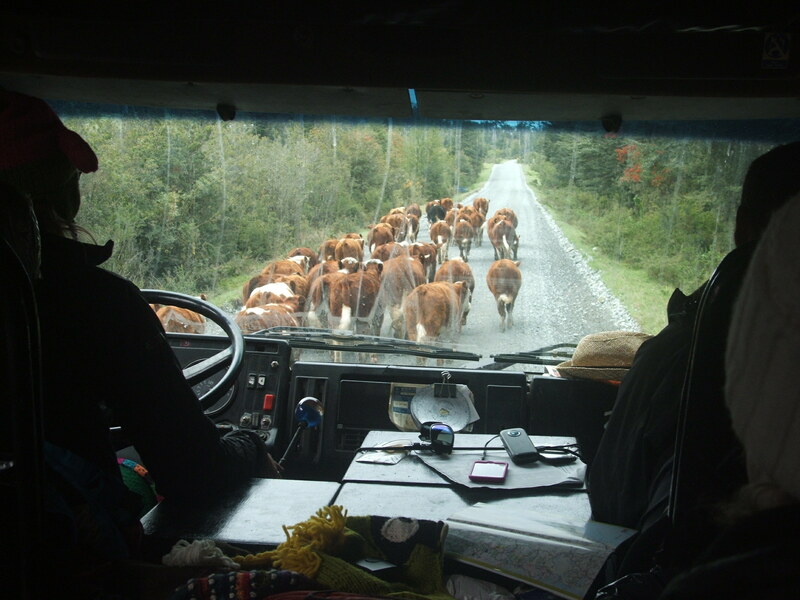 Our truck continued down the Carretera Austral and all too soon, we were back on ordinary tarmac. Although much of the landscape had been hidden by mist, I felt lucky to have seen it at all. For many people, a flight to Punta Arenas is their entry point into Patagonia, thus skipping the route entirely. If a couple of weeks is all the holiday you can spare, then flying is probably the best option. But for those with the luxury of time, travelling along this bumpy and beautiful road is truly a great experience.